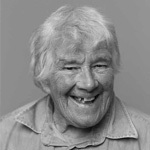 Dervla Murphy is Ireland’s most prolific travel writer who for five decades has travelled the world mostly alone, and mostly by bicycle. A fiercely independent woman who turned her back on societal conventions at a time when few were as brave, she observed and recorded the world with wonder and curiosity, and an astute political sensibility. Few have ever explored the world on two wheels as has Dervla Murphy, she joins us to reflect on her literary work and the great journeys she has undertaken. Murphy’s extraordinary autobiography, Wheels Within Wheels, documents her travelling life since 1963, tracing the her route from Ireland to India by bike, via Afghanistan. Her last journey was to Palestine and is recounted in Between River and Sea: Encounters in Israel and Palestine. Before that there have been some 20 other books, about journeys that have taken her all over the world, from Peru to Pakistan, from Africa, India and Siberia to Cuba, Romania and Laos. In all her journeys, she has biked, walked or simply improvised her way through countries when bikes broke down or were stolen, or her own limbs proved temporarily untrustworthy. Only weeks into her first journey in 1963, she shot a wolf that threatened attack in rural Yugoslavia by using a gun she had acquired and learnt to use in Ireland, with the support of helpful, if astounded, Lismore gardaí. Nothing thereafter, including increasing age, ever appears to have daunted her. Murphy will join Dorothy Allen in conversation.